Exoskeleton suit problems need to be overcome if we are to fully realise this technology. Chief amongst these areas is the power source. Currently, there is no way of providing power to these suits for extended periods of time. 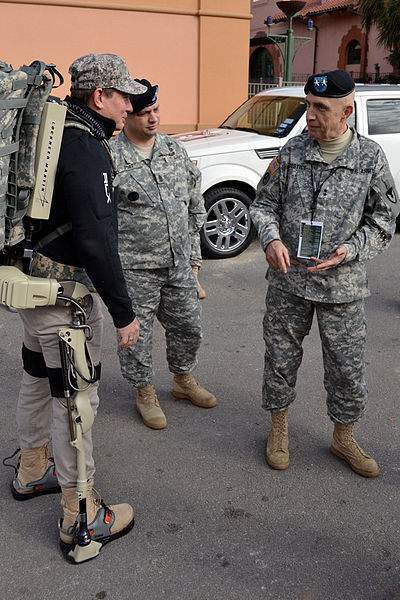 Some prototype suits like the XOS exoskeleton operate through tethered power cords and are far from mobile. Being tied to mains electricity certainly limits freedom. Though the battery-powered HAL exoskeleton suit has a claimed run-time of two hours and 40 minutes, it is still a far cry from being able to operate for a full-day without needing to recharge. There are three main ways to power exoskeleton suits. All have their advantages and disadvantages but only one has got a future. The internal combustion engine (ICE) has one advantage in that it is a readily available mature technology. It is also powered by a fuel with a high energy density. Nonetheless, combustion engines are one of the worst choices for exoskeleton suits. Their exhaust fumes mean they cannot be used indoors and such close proximity to the wearer would undoubtedly be a major health concern. The excess heat that ICE’s generate would mean that an added cooling unit would be necessary. This further adds to the complexity of the suit. What’s more, combustion engines’ need to idle does little to help their already paltry efficiency levels. All of these drawback together with an inability to modulate power smoothly means that the internal combustion engine is a non-runner. A second solution to the exoskeleton suit problem of a power source are hydrogen fuel cells. Though they may be of short-term benefit until electric battery technology develops, realistically hydrogen fuel cells are at best just a temporary stop-gap measure..
Splitting hydrogen from oxygen is more energy intensive than obtaining the fuel from hydrocarbons. Hydrogen fuel cell inefficiency compared to batteries and the fact that they are obtained from an ever-decreasing supply of fossil fuels does little to champion their green credentials. As exoskeleton suits will eventually become as common place as cars today having hydrogen fuel stations in sufficient quantities in populated areas becomes a very problematic task. Economically it is not feasible to waste so much energy producing and storing hydrogen for so little energy in return. It takes more than two kilowatts of electricity to obtain one kilowatt of hydrogen gas. It takes more than twice that energy again to compress the hydrogen into a more compact form. More energy again would be required for an exoskeleton suit. Whereas an electric battery takes just over one kilowatt of electricity in order to store one kilowatt. In real terms, this means that only one quarter of the energy reaches the electric motor with hydrogen whereas with batteries this figure is 95 per cent or higher. The extremely flammable nature of hydrogen and the threat it poses to public safety means that such stations will have to be located in non-populated areas making access cumbersome. For the same reason that we will probably never see mass-produced hydrogen-powered cars we will also never see mass-produced hydrogen powered exoskeleton suits. The best option for powering exoskeleton suits rests with the electric battery. Energy efficient, pollution-free and ultra quiet, batteries are the preferred choice. Though future energy density needs to greatly improve if exoskeletons are to operate for long periods of time without needing to be constantly recharged. Exoskeleton suit problems that remain revolve around the issue of safety. Sudden involuntary or unplanned movements could result in serious injuries if safety protocols were not designed correctly. Fully mimicking the motions of the human body may prove much more difficult than the designing safety protocols. The flexibility of the spinal column may be the trickiest puzzle that requires solving. Wikipedia have a highly comprehensive piece on powered exoskeleton suits. You may wish to read Exoskeleton Suit Reality: Iron Man May Be Closer Than You Think, Exoskeleton Suit Impact: What It Will Mean For Our Future and Exoskeleton Suit Benefits: Enabling The Disabled And Able-Bodied. Wearable Robots: Biomechatronic Exoskeletons is an in-depth look at current exoskeleton suits, their limitations and their future. You can obtain Wearable Robots: Biomechatronic Exoskeletons here from Amazon. For people living in Ireland or the United Kingdom, you can access: Wearable Robots: Biomechatronic Exoskeletons from here. For Canada: Wearable Robots: Biomechatronic Exoskeletons . For Germany: Wearable Robots: Biomechatronic Exoskeletons . For France: Wearable Robots: Biomechatronic Exoskeletons .